Waraq Al-‘Enab or Waraq Al-Dawali means Grape Leaves. Yalanji: Grape leaves stuffed with rice and vegetables, served as appetizer. I posted the recipe last year. 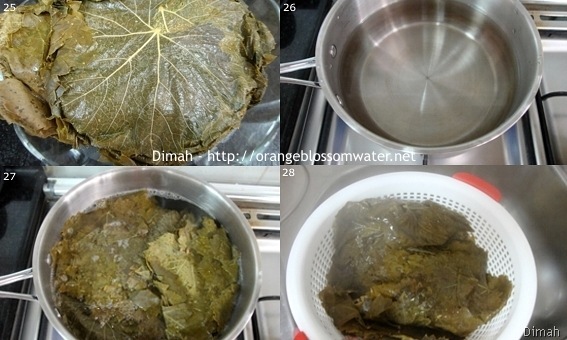 Yabraq: Grape leaves stuffed with rice and meat, cooked in lemon juice, served as main course. I’ll post it next. Before the post “Yabarq”, I preferred to write this post about grape leaves, so that will give you some information about the preparations of grape leaves. 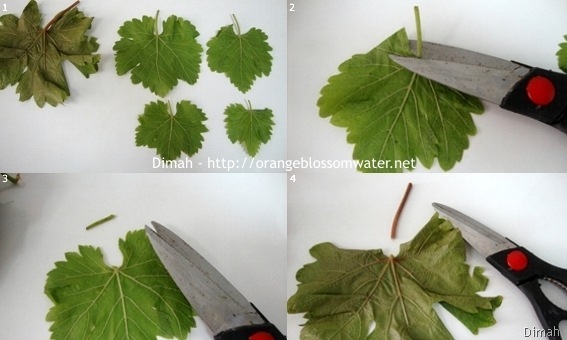 How to Use Fresh Grape Leaves? How to Store Fresh Grape Leaves in the Freezer? Notes: Some photos and steps are repeated. I learned these techniques from my grandmother and my mother. Yalanji: Always use the large sizes, but do not choose the leaves which are too tough or have a velvety texture. Yabraq: Always use the medium and small sizes. You have fresh grape leaves and you want to make one of the dishes, should you bring the leaves and just stuff them? No, you have to follow some steps before that. 1. These are the different sizes of grape leaves. 2, 3, 4. Cut off the stem of each leaf. 5, 6. Bring the medium and small sizes of grape leaves, and make a stack of them, both sizes are together in one stack. 7,8. Bring the large sizes of grape leaves, and make a stack of them. So from this step, you will get two stacks, one with small and medium sizes, the other with the large sizes. 9. In a pot, add water and bring it to boil, then turn off heat. 10, 11, 12. Add both stacks to the water. 13. Wait until the color turns into yellow. 14. When the color turns to yellow, keep the leaves in the water for 10 minutes. 15. Skim each stack using slotted spoon. 16. 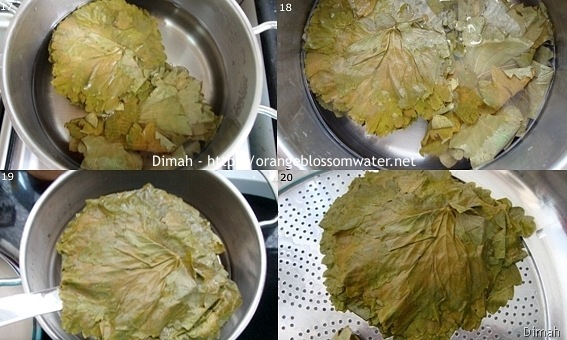 Place both stacks on a strainer to drain, then the leaves are ready to be used and you can prepare any stuffed grape leaves dish, so when you want to make yalanji you will use the large sizes, and when you want to make yabraq you will use the medium and small sizes. 17, 18. This is the large leaf, both sides of the leaf, always the filling is added to the side where the veins of the leaves are most prominent (picture 17). 19, 20. This is the small leaf, both sides of the leaf, always the filling is added to the side where the veins of the leaves are most prominent (picture 19). 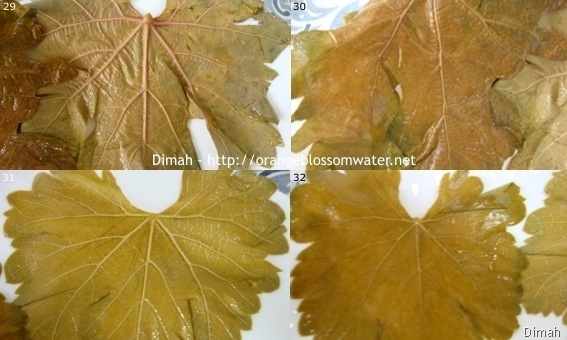 Water These are the different sizes of grape leaves. Bring the medium and small sizes of grape leaves, and make a stack of them, both sizes are together in one stack. Bring the large sizes of grape leaves, and make a stack of them. So from this step, you will get two stacks, one with small and medium sizes , the other with the large size. In a pot, add water and bring it to boil, then turn off heat. Add both stacks to the water. Wait until the color turns into yellow. When the color turns to yellow, keep the leaves in the water for 10 minutes. Skim each stack using slotted spoon. 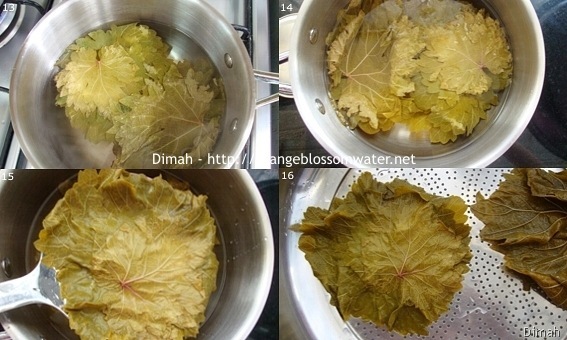 Place both stacks on a strainer to drain, then the leaves are ready to be used and you can prepare any stuffed grape leaves dish, so when you want to make yalanji you will use the large sizes, and when you want to make yabraq you will use the medium and small sizes. This is the large leaf, both sides of the leaf, always the filling is added to the side where the veins of the leaves are most prominent (picture 17). 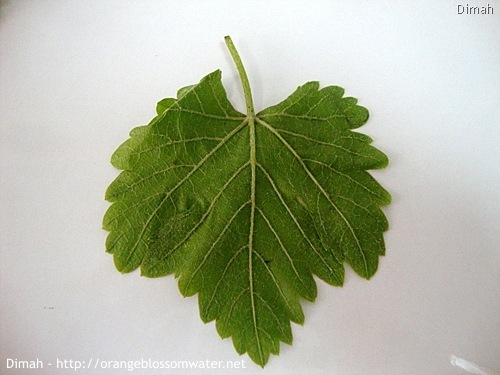 This is the small leaf, both sides of the leaf, always the filling is added to the side where the veins of the leaves are most prominent (picture 19). You have fresh grape leaves and you want to store them in the freezer? what to do? 7,8. Bring the large size of grape leaves, and make a stack of them. 9. In a pot, add water. 10. Add coarse sea salt. 11. Turn on heat, stir to dissolve the salt. 12. Turn off heat, use an egg to test the quantity of the salt, if the egg floats on the surface so the amount of the salt is correct. 13. 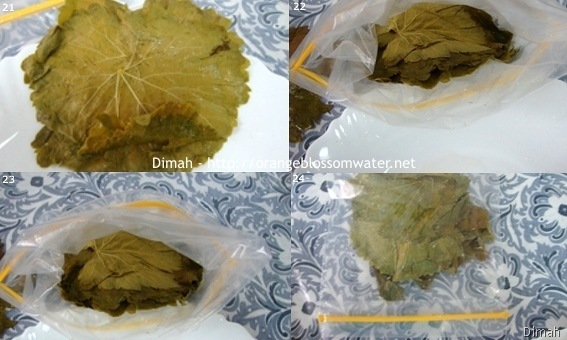 After you turned the heat off, wait for some time, then test the temperature of the water using your finger, if you can handle the temperature, so it is the time to add the stack of grape leaves. 14, 15. Add both stacks to the water. 16. Keep in the salted water for the next day. 17, 18. Next day, the color changed. 19. Skim each stack using slotted spoon. 20. Place both stacks on a strainer to drain. 21, 22, 23. In two ziplock bags, put the stack of the medium and small sizes in one bag, in the other bag put the stack of the large sizes. So when you want to make yalanji you will use the large sizes, and when you want to make yabraq you will use the medium and small sizes. 24. Close the bags, and put them in the freezer. 25. If you want to make stuffed grape leaves, and use the frozen leaves, what to do? Take the bag from the freezer and take from it the frozen grape leaves, of course you should choose the sizes of the leaves according to the dish. 26. In a pot, add water and bring it to boil. 27. 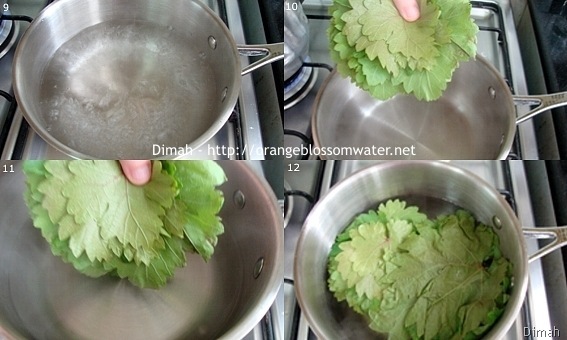 Turn off heat, add the stack of grape leaves to water, and keep for 10 minutes. 28. Place the stack on a strainer or colander to drain, then the leaves are ready to be used and you can prepare any stuffed grape leaves dish. 29, 30. This is the large leaf, both sides of the leaf, always the filling is added to the side where the veins of the leaves are most prominent (picture 28). 31, 32. This is the small leaf, both sides of the leaf, always the filling is added to the side where the veins of the leaves are most prominent (picture 31). 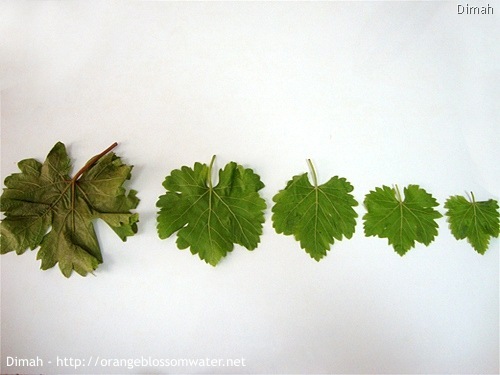 Egg, to use in a test These are the different sizes of grape leaves. Cut off the stem of each leaf. Bring the large size of grape leaves, and make a stack of them. Turn on heat, stir to dissolve the salt. 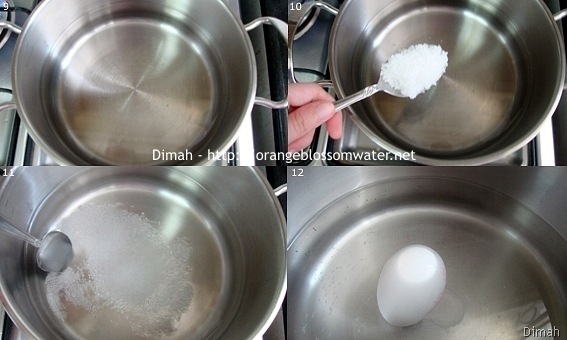 Turn off heat, use an egg to test the quantity of the salt, if the egg floats on the surface so the amount of the salt is correct. 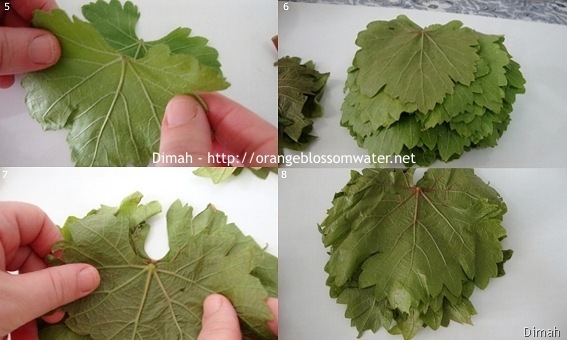 After you turned the heat off, wait for some time, then test the temperature of the water using your finger, if you can handle the temperature, so it is the time to add the stack of grape leaves. Keep in the salted water for the next day. Next day, the color changed. Place both stacks on a strainer to drain. In two ziplock bags, put the stack of the medium and small sizes in one bag, in the other bag put the stack of the large sizes. So when you want to make yalanji you will use the large sizes, and when you want to make yabraq you will use the medium and small sizes. Close the bags, and put them in the freezer. If you want to make stuffed grape leaves, and use the frozen leaves, what to do? Take the bag from the freezer and take from it the frozen grape leaves stack, of course you should choose the sizes of the leaves according to the dish. In a pot, add water and bring it to boil. 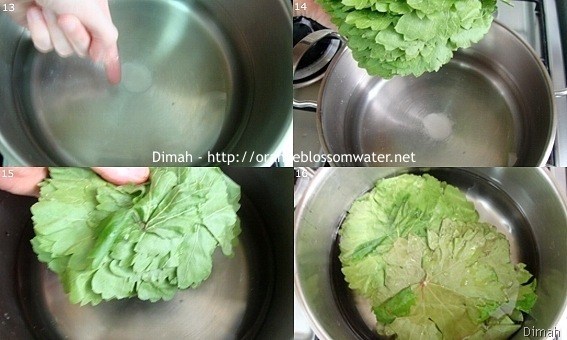 Turn off heat, add the stack of grape leaves to water, and keep for 10 minutes. Place the stack on a strainer or colander to drain, then the leaves are ready to be used and you can prepare any stuffed grape leaves dish. This is the large leaf, both sides of the leaf, always the filling is added to the side where the veins of the leaves are most prominent (picture 28). This is the small leaf, both sides of the leaf, always the filling is added to the side where the veins of the leaves are most prominent (picture 31). This entry was posted on Saturday, April 17th, 2010 at 5:50 PM	and is filed under Syrian Ingredients. You can follow any responses to this entry through the RSS 2.0 feed. You can skip to the end and leave a response. Pinging is currently not allowed. How interesting! I absolutely love stuffed grape leaves. Interesting! Stuffed grape leaves are so delicious! I really enjoy eating grape leaves but would have NO idea how to prepare them – thanks! I am so glad you left a comment on my blog. claudia Roden is my favourite cookbook author, and I have been fascinated by the cooking from your region. A good friend of mine went to Damascus last year, and brought back spiced coffee, saffron and soap (so, that’s not food but I love the scent). Some day, I’d like to visit Damascus, but in the meantime I love it that I could come into your kitchen by visiting your site. This is a fascinating post! I knew that stuffed grape leaves were labor intensive and now I know why. Thanks for visiting my blog so I could discover yours! I’ve never been lucky enough to find grape leaves, but I’m happy to have this information should I come across them! Thanks for the in-depth post. Oh! Love the informations on your post :-) I never used grape leaves in my cooking but love to eat the stuffed ones. Crepes of Wrath: Thanks for the kind comment! Simply Life: Thanks for stopping by! Hannah: Thank you for the sweet comment!